Here's a number in the news - 79. That's how many moons astronomers have now identified orbiting the planet Jupiter. The first four moons were discovered by Galileo in 1610. As NPR science correspondent Joe Palca reports, the 12 newest moons were announced today. JOE PALCA, BYLINE: Several times a year, Scott Sheppard heads to telescopes around the world to search for distant objects in our solar system. Sheppard is an astronomer with the Carnegie Institution for Science. In March last year, he was at the Blanco four-meter telescope in Chile. And he realized that Jupiter was right near the part of the sky he wanted to search. SCOTT SHEPPARD: So we could also search for Jupiter moons while looking for things that are well beyond Pluto. PALCA: One thing that helped was an especially large camera attached to the Blanco telescope. SHEPPARD: It allows us to search the whole area around Jupiter in a very few images. PALCA: And they found 12 new moons. As they report today in an online notice from the International Astronomical Union, all have now been confirmed by other telescopes. Nine of these moons are from a previously discovered cluster of moons that are in what astronomers call a retrograde orbit. SHEPPARD: They're going around the planet in the opposite direction that Jupiter rotates. 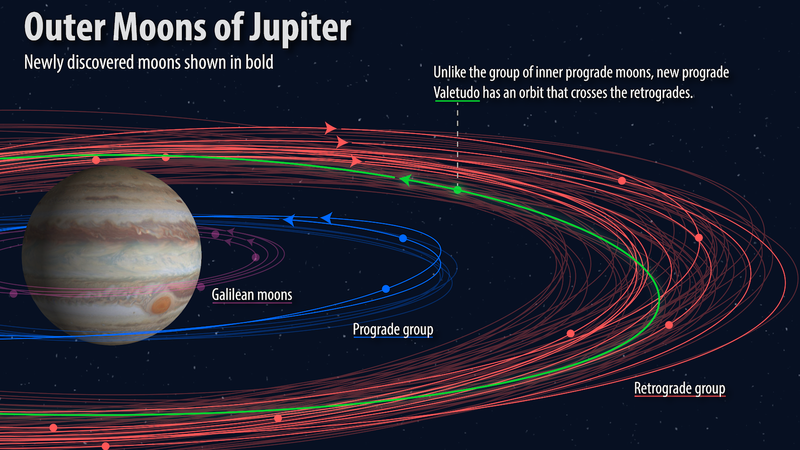 PALCA: Many of Jupiter's moons form from the same spinning disk of stuff that eventually coalesce to form the planet. Sheppard says these retrograde moons were probably objects that were once wandering around the solar system. SHEPPARD: They didn't form with Jupiter. 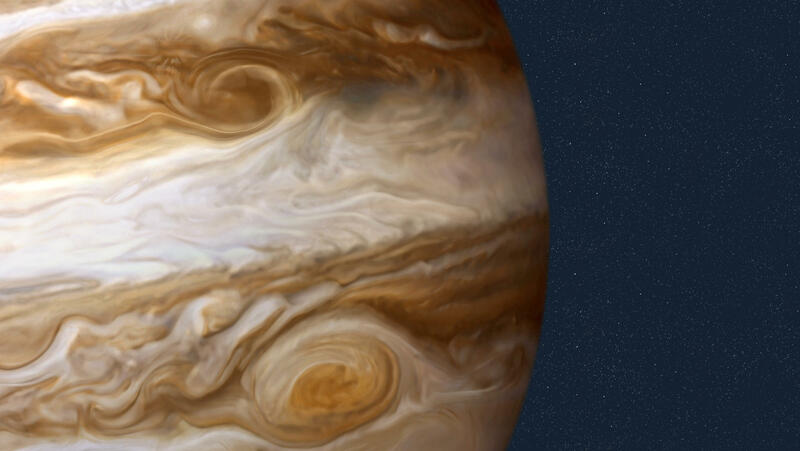 We think Jupiter captured them as these objects got too close to Jupiter in the past. PALCA: One of the strangest moons Sheppard and his colleagues discovered is only one kilometer across. They're proposing to call it Valetudo, named after the Roman God Jupiter's great-granddaughter. It's in an orbit that takes it directly through the cluster of retrograde moons. The thought is Valetudo is all that's left of a much larger moon that smacked into one of these retrograde moons, busting the larger moon to pieces. Sheppard says more searching should turn up more moons - maybe a hundred or more of the really small ones. But seriously, does something less than a mile across deserve to be called a moon? SHEPPARD: Maybe there would have to be something - new definition of small - for the small moons. Maybe a dwarf moon for anything that's one kilometer in size or smaller. PALCA: Come on. It's got to be mini-moon, don't you think? SHEPPARD: Mini-moon - yeah, that has a pretty good ring to it, too. PALCA: Joe Palca, NPR News. (SOUNDBITE OF YACHT SONG, "SHANGRI-LA") Transcript provided by NPR, Copyright NPR.